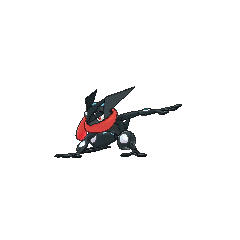 Greninja in game: 924 Who? Important notice! Pokemon Greninja is a fictional character of humans. Greninja (Japanese: ????? Gekkouga) is a dual-type Water/Dark Pokémon introduced in Generation VI. It evolves from Frogadier starting at level 36. It is the final form of Froakie. With the Battle Bond Ability, it can transform into a special form known as Ash-Greninja. 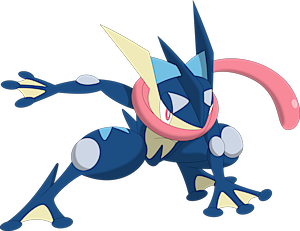 Greninja with the Ability Battle Bond cannot breed. Ash's Frogadier evolved into a Greninja in A Festival of Decisions! 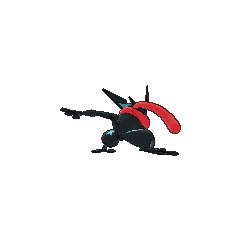 while battling Heidayu's Bisharp and soon gained the ability to transform into Ash-Greninja. A Greninja appeared in A Stealthy Challenge! under the ownership of Sanpei. Greninja made its debut in A Rush of Ninja Wisdom! under the ownership of Ippei, but only in a fantasy. His Greninja first appeared in the flesh in The Legend of the Ninja Hero! and reappeared in A Festival of Decisions!. A Greninja appeared in Diancie and the Cocoon of Destruction under the ownership of Riot. 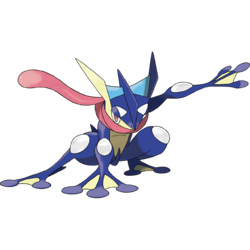 Y's Frogadier, Croaky, evolved into a Greninja during a battle against Xerosic. It composes throwing stars out of compressed water. When it spins them and throws them at high speed, these stars can split metal in two. 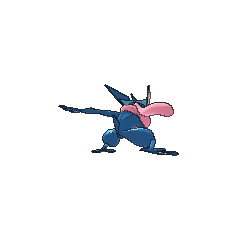 Greninja won first place in the Japanese Pokemon general election 720 (Japanese: ?????? ?720) poll to decide what Pokémon would be distributed at showings of Volcanion and the Mechanical Marvel in Japan. Greninja is based on a frog, and may have been inspired by horned frogs from the genera Megophrys and Ceratophrys due to the spiked protrusions above its eyes. Its coloration and body shape is similar to the splendid leaf frog. The bubble-like protrusions on its body may be based on a toad's parotoid glands, possibly referencing the traditional myth of toads causing warts, though they may also be remnants of Froakie and Frogadier's frog foam. As its species name implies, Greninja is also based on a ninja. Japanese culture associates frogs and toads with ninjas based on the folk story "The Tale of the Gallant Jiraiya" (??????? Jiraiya Goketsu Monogatari) about a ninja who can shapeshift into a large toad. Gekkouga is a combination of ??? geko (croak) and ??? Koga-ryu. It may also derive from ?? gekko (moonlight), in reference to a popular conception of ninja running through the night or to Greninja's Dark typing, or a combination of both.